Brown wool sport coat worn by James Dean as Cal Trask in ”East of Eden.” Cal Trask was Dean’s first leading role and ”East of Eden” the only one of his films released during his lifetime. His Academy Award nomination for Best Actor was the first posthumous nomination made by the Academy. Accompanied by an 8” x 10” photograph of Dean wearing the coat in the film. Near fine condition. From the James Dean Museum archive, with provenance from Heritage. Sold for $11,858. 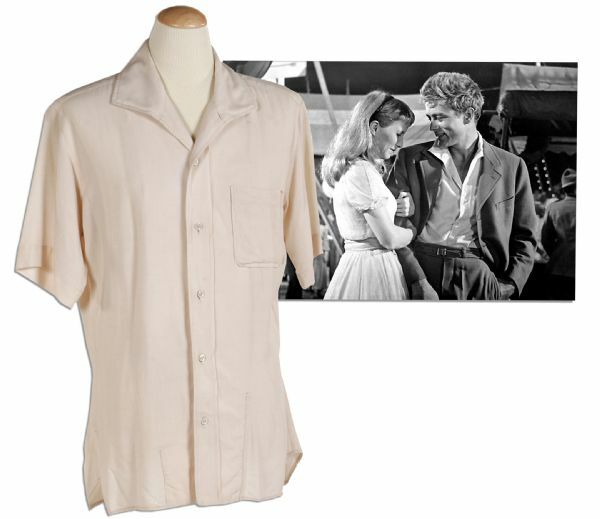 James Dean’s shirt from his role as Cal Trask in ”East of Eden.” Sewn-in Warner Brothers production tag dated 27 May 1954 and marked ”Jim Dean.” Formerly in the James Dean Museum archive. Very minor wear, else near fine condition. From the James Dean Museum archive, with provenance from Heritage. Sold for $11,858 too. 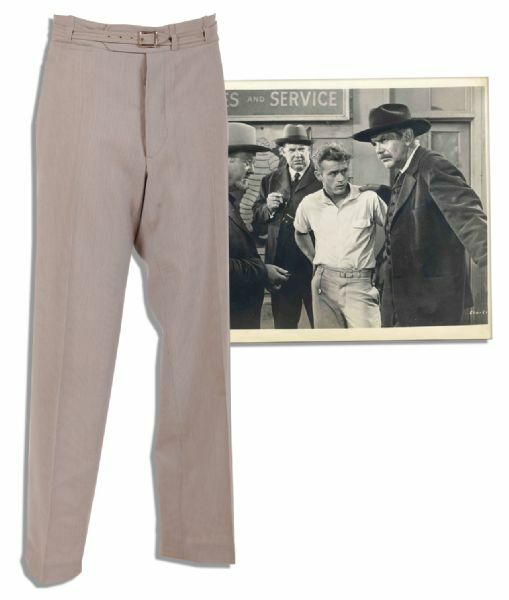 James Dean’s trousers worn for his role as Cal Trask in ”East of Eden.” Light gray pinstriped trousers with Warner Brothers production tag sewn into waistband dated 21 May 1954 and marked ”Jim Dean.” Together with a black and white glossy 8” x 10” photo of Dean wearing the trousers. Mild discoloration to pants, otherwise near fine condition. From the James Dean Museum archive, with provenance from Heritage. Sold for $11,596. 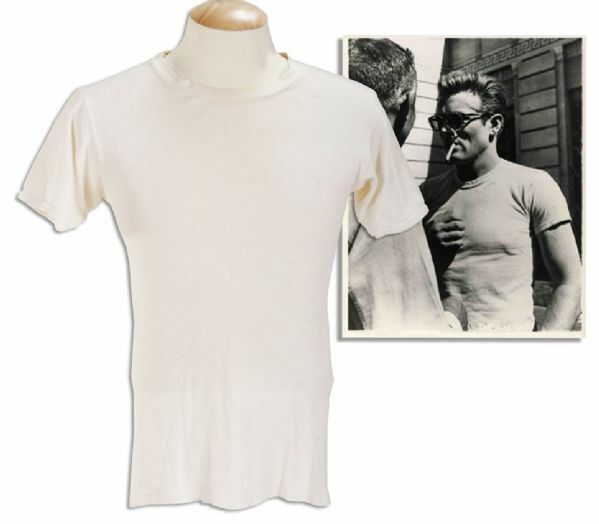 White t-shirt worn by James Dean in ”Rebel Without a Cause,” the film that cemented Dean’s reputation as a cultural icon and one of the most popular stars in the history of American cinema. T-shirt sales soared after Dean was shown wearing this shirt in the film. T-shirt was originally obtained from make-up artist Gordon Bau who did Dean’s make-up in three of his films, and shirt is accompanied by an 8” x 10” black & white photo of Dean wearing the shirt on set. Shirt shows mild discoloration due to age and wear along neckline, else near fine condition. With provenance from The James Dean Museum archive, Heritage, R&R, and a letter describing its original procurement from Dean’s makeup artist. Sold for $6,083. 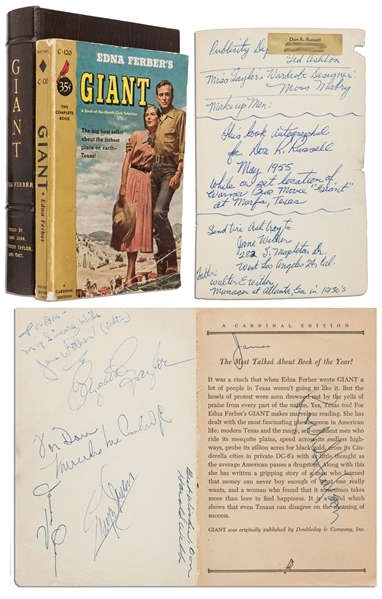 Crew-signed copy of ”Giant” by Edna Ferber, published by Pocket Books: New York: 1953. Paperback is signed upon the front pastedown and fly-leaf by the stars of the film: ”James Dean”, ”Elizabeth Taylor”, ”Rock Hudson”, ”Jane Withers”, ”Mercedes McCambridge” and by the director ”George Stevens” and special effects designer ”Harold Webb”. Webb, Withers and McCambridge add a dedication in their hand. 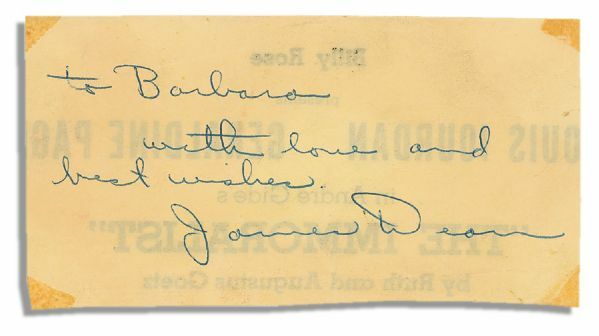 James Dean may have signed twice as ”James” appears again above Rock Hudson’s signature. Book runs 389pp. and measures 4.25” x 6.25”, housed in a chocolate leather case with gilt lettering. First leaf is absent. Handwritten note and prior owner’s sticker on rear pastedown. Creasing to covers and surface loss to rear cover. Very good condition. Sold for $5,625. James Dean signs a portion of a 1954 Broadway show program in which he starred. On the verso of ”The Immoralist” program, Dean writes, ”to Barbara with love and best wishes. James Dean”. The young actor took minor roles in a number of commercials and TV shows before training at New York’s famed Actors Studio. His role in this early 1954 Royale Theatre production earned him the Theater World Award for 1954 and the positive reviews helped land him a role in the Hollywood version of ”East of Eden.” Dean’s Oscar for ”East of Eden” was presented posthumously because of his untimely death in 1955 in a high-speed car crash which elevated him to the status of Hollywood legend. Light toning and paste residue to the 4.5” x 2.25” autograph, else near fine. With PSA/DNA COA. Sold for $3,355.